Remember Marty McFly? Well, if you love him and of course, Doc Robbins, then you must have this cool Back to the Future Framed Print! Wonderfully printed on high quality paper, this print is available in two sizes: A2 and A3. 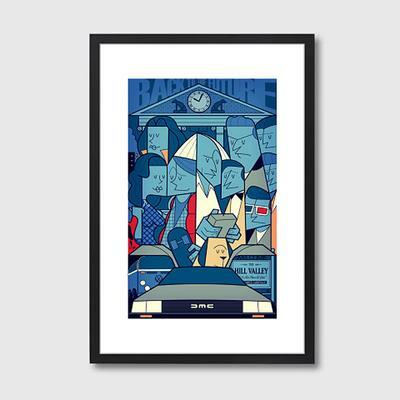 The print itself is colourful and features a caricature of the cast including the iconic, De Lorean at the front and centre. The print is matted in white and then finished using a black wooden frame. This allows the colourful print to be the focal point. As a final touch, shatter proof Perspex is added to help protect the art piece. You can hang this on your wall or give this away as a present to a big Back to the Future fan. It will definitely make them happy.